Don’t be shy. If you are interested in attending an Excipio event, please reach out and be our guest! Figuring out how to solve your golf’s short game is very similar to organizations developing a Disaster Recovery Strategy. Join Flexential for a discussion on disaster recovery followed by a golf clinic with Eric Chile’s “Top 100 Golf Instructor”. Each attendee will receive a New Titleist 56 SW.
Join Excipio, Flexential and Zerto for breakfast for a thought-leading breakfast-and-learn around disaster recovery and how to determine if your organization is prepared for an outage. 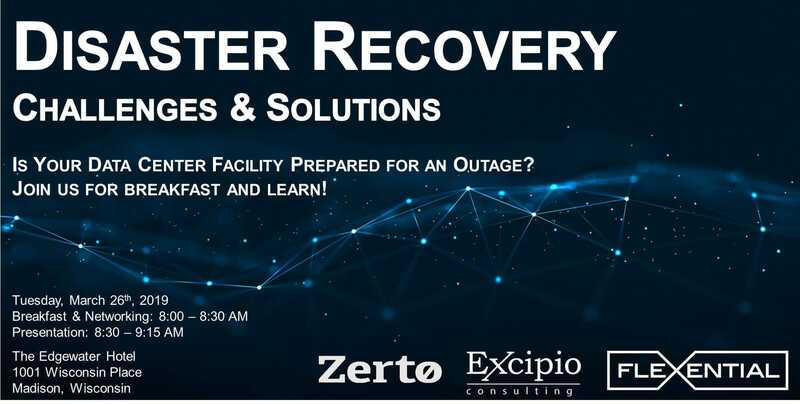 Join Excipio at data center world for a thought-leading breakfast-and-learn around disaster recovery and how to determine if your organization is prepared for an outage. Join Jeff Gilmer from Excipio and Rabin Mahanty from H5 for breakfast and discuss the changing landscape of the data center. This workshop focuses on the increasing number of potential solutions, how to determine which is best for your organization, and a roundtable discussion on the pros and cons of each. Excipio has worked with hundreds of organizations, assessing their unique requirements and capabilities to create comprehensive, successful strategies. Excipio is vendor-neutral and known for providing trustworthy and objective recommendations. Is Your Facility Prepared for an Outage? 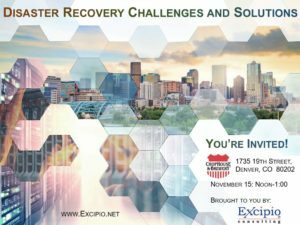 Join Excipio at Denver’s ChopHouse & Brewery on Nov 15th for a thought-leading lunch-and-learn around disaster recovery.